"While trading is tough all round we are very pleased to have turned in above-average sales figures for December 1st to the 24th with continued growth in both profit and margin," says group managing director, Justin Farrington Smith, who puts the festive season success down to long-term campaign planning and the resolution a logistics issue that had dogged the company's 2011 trading. "We started planning our Christmas campaign back in January, giving us plenty of time to hone our offer, while being well clear of IT problems that held us back the previous year also meant we enjoyed excellent availability in-store," he says. 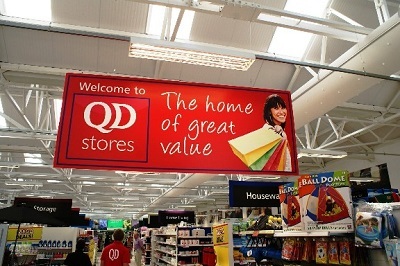 Norwich-based QD operates 38 retail outlets under the QD, Lathams of Potter Heigham and Cherry Lane Garden Centre brands, extending from the eastern England and Home Counties as far north as Doncaster and west as Wrexham. Christmas trading for the group (excluding some 2012 store openings) saw like-for-like store sales of festive decorations, novelties and lights up by 16.64%; toys up by 33.27%; menswear up by 20.78%; grocery up by 26.38%; household cleaning and toiletries up by 43.88%; with plants and seeds sales at the Cherry Lane Garden Centres increased by 26.37%. QD expanded its Cherry Lane Garden Centre chain to a total of nine sites during 2012 with the acquisition of a new build site at Towcester in Northamptonshire. The group also acquired the freehold and assets of Croft Nurseries & Garden Centre in Beverley, Yorkshire and the purchase of a new build garden centre site at Cromford, Derbyshire. A joint redevelopment with food specialist retailer Morrisons of the former Buyright site at Hadleigh, Suffolk also provided QD with a new 20,000 sq ft store and an existing wraparound garden centre space. QD Christmas 2012 results do not include the Towcester, Beverley and Hadfield sites nor online sales and Justin Farrington Smith is optimistic for the company's prospects in 2013. "We are working on a major e-commerce re-launch for 2013 with further stores commencing trading so we anticipate an even stronger sales performance for next Christmas," he says. QD reported a Christmas 2011 trading increase of 5.66% compared to the same period the previous year.